After living and/or working in the east end of Toronto for over 8 years, I've fully fallen in love. I couldn't imagine living in another part of the city. There are so many families here and almost everything I could ever want or need is within walking distance from my house. Our friend Jim maintains that you can physically feel the "cool factor" rise as you take the subway across the Don Valley Parkway. I had a generous 16-month mat leave after Seb was born. And because I had a rule that I had to get out of the house every day at least once, I banked a pretty healthy list of great places to take babies and young toddlers. If you're on mat leave in Toronto anywhere east of the DVP, check out some of these places. 1. East End Children's Centre - (0 - school age) There are 2 locations for the East End Children's Centre, but we always go to the Kimbourne location because it's closest to us. A massive church basement full of toys for babies, toddlers and young kids of all ages. Rob loves taking Seb here on Saturday mornings, so I can get a few things done around the house. They provide snack, circle time, and have crafts, a climbing structure, a train table, a sand table, a play kitchen, puzzles etc etc etc. Cost - $1 donation. 2. Playground Paradise - (cruising babies -12 yrs old) The hours here are a bit all over the place, and it can get filled up quickly on weekends, so I found the best time to go was as soon as it opened in the morning. There are slides, a ball pit, large foam blocks, and a few fun toddler play structures for little ones. There are also lots of activities for older kids and a splash pad outside. 3. Oaks 'N Acorns - (0 - 6 yrs) Another stay and play café on the Danforth. It can also get pretty busy, but it's bigger than Lil' Bean N' Green. I've been here for a birthday party too which was super fun, and they're always having lots of great themed workshops for young kids. They also offer classes, but I haven't tried any of them either. 4. Baby and Me Fitness/Stroller Fit - (0 - 12 months ish) You can find Stroller Fit classes all over the city, but this is the one I took and really liked. Fresh air and a bit of a workout in the summer did us both some good. 5. Gymboree Play and Learn Classes - (0 - 5 yrs old) Seb and I practically lived at Gymboree for the first year of his life. We loved their Play and Learn Classes and, although it's one of the pricier baby activities, I felt it was really worth it, especially on days when the weather kind of sucked. Just a note - you can claim the cost of Gymboree Play and Learn classes on your taxes under the Children's Fitness Tax Credit. 6. Kids Fun Town - (babies and up) Kids Fun Town isn't always my first choice because I find it a bit small, but, unlike the stay and play cafés, it's open on Sundays and holidays, so I do love that. There is a large bouncy castle inside, a small ball pit, and a variety of toys. 7. Toronto East/Broadview EYC - (0 - 6 yrs) All Ontario Early Years Centre programs are free (or...prepaid by your taxes if you prefer lol) and until we had a serious nap schedule, we went often to the Broadview Baby and Me program on Friday afternoons. Each week there was a different theme or activity like mommy and baby yoga, circle time, or visits from public health nurses. I really enjoyed this program. Be sure to call and register the week before, as they tend to fill up. 8. 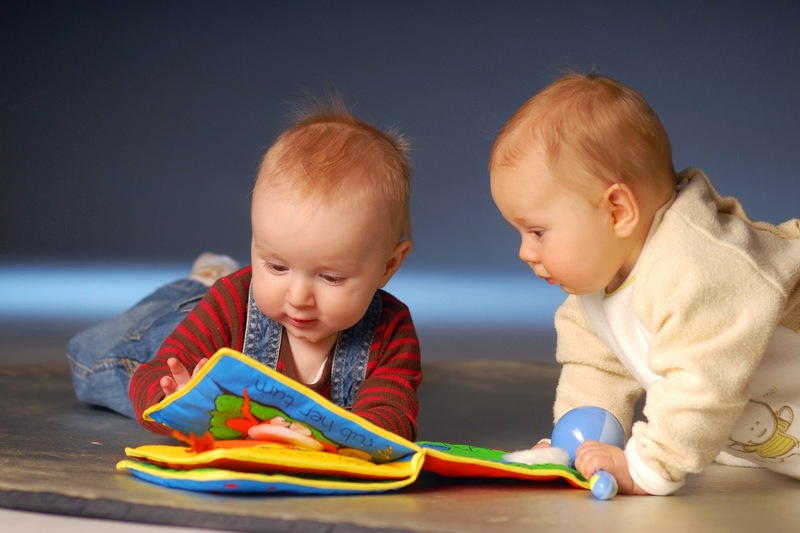 EYET Book Corner - (all ages) The Beaches East York site has plenty of similar Early Years programs. We also really like their Book Corner on Tuesdays at 4:30. To encourage literacy at home, you can go and pick up a couple of donated books that are yours to keep free. 9. Movies for Mommies - (0-7 months or so) Miss going to the movies because you've been home every night with bébé? Then this is perfect for you. Seb and I did this once, and I did really enjoy it. He slept in my lap for about half of the movie, but when he was fussing I didn't feel guilty at all because the theatre was full of moms doing the same thing. I think this outing is great until your baby gets mobile, then they may be a little too squirmy. 10. Skyzone - (walking toddlers and up) Skyzone is an indoor trampoline park and on Tuesday and Thursday mornings they have Toddler Time where only toddlers are allowed in to jump. If your baby/toddler is anything like mine, jumping is his absolute favourite thing to do ever, so this is pretty fun. It's also extremely busy so get there early. 11. Swimming Lessons - (6 months and up) This is also something you can find all over the place. I've done the summer outdoor swimming lessons through Toronto Parks and Rec a few times, and also the diaper fit classes through H2O Fit. Diaper and Toddler Fit classes are offered on Saturdays at Monarch Park Collegiate. 12. Monkey Magoo's - (1ish and up) I'd say around 1 is a great age to start taking babies here. It's a big play space with plenty of toys, a ball pit, a slide, and lots of ride on cars etc. They also have complementary tea and coffee for the mamas. Note - on weekends they are almost never open to the public because they do so many birthday parties. They keep their website pretty up to date with birthday party closures, but during the week is when you want to plan to go here. 13. Sprouts - (0 - 7 yrs old) This place is very similar to Gymboree. You can read all about Sprouts on a post I previously did here. 14. Toronto Public Library Baby Time - (0-18 months) Our local branch, Danforth/Coxwell, runs their Baby Time program by lottery, and we never got in; however, I'd still try if I was on mat leave again. It's a 45 minute story, rhymes, and songs program. I don't think it runs in the summer. If you don't get in to the sessions, just head to the library anyways. The back corner of the kids' section has 2 bins filled with board books, and we often go just play and flip through the books on our own. 15. Living and Learning with Baby Program - This is a free 6 week program offered by Toronto Public Health. Call and register as soon as you have your baby to be put on the wait list for your nearest location. The program is advertised for babies 6 weeks - 6 months old, but the wait list was so long at my location that at 6 months, Seb was the youngest baby in our session. Most babies were 6-8 months old. This program was a really great way to connect with new moms. 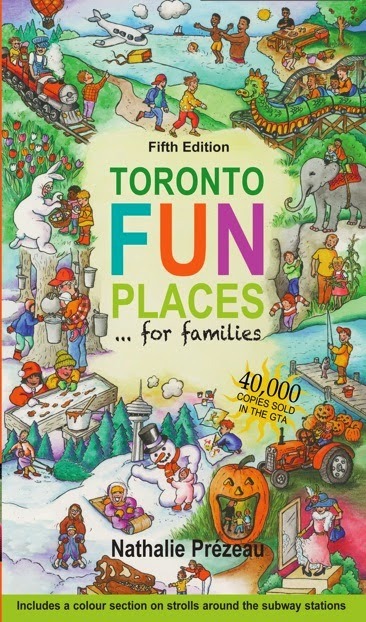 From the author of Toronto Urban Strolls for Girlfriends, is also the book, Toronto Fun Places for Families. This 450 page book is full of activities and excursions for families in the GTA. Plus, this book will grow with your family. It's not just for babies and toddlers and includes a ton of things to do with older children as well. And finally, if you're looking for even more, awhile back I wrote a guest post for the Rookie Moms called Baby Activities in Toronto that has other ideas for things to do all over the city with your baby. Despite what it looks like, I know this list isn't exhaustive. These are just the places I've personally tried. Add any of your favourites in the comments section.